A backup battery for your phone is only useful if you're willing to carry it with you. 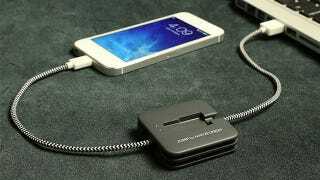 So Native Union has come up with the JUMP which integrates a little extra power into your smartphone's charging cable, ensuring it's light enough to carry and always has a little bit of extra power to keep your device running. The JUMP's small inline battery is only packing about 800mAh of power, but its designers claim that's enough to replenish the iPhone's battery about a third of the way. And because it's actually integrated into the cable, it starts charging as soon as your device is topped off, meaning that as long as you remember to charge your phone at night, the JUMP will be powered up too.